The Beall Pen Wizard is an ornamental pen lathe, which can be used to add designs to the turned barrels of pens in the form of spirals, wave patterns, or flats. A Dremel-type multi tool or a flexible shaft machine such as a Foredom, fitted with suitable burrs or router bits, is needed to make the cuts. I used my Dremel which screwed straight into the fitting provided. 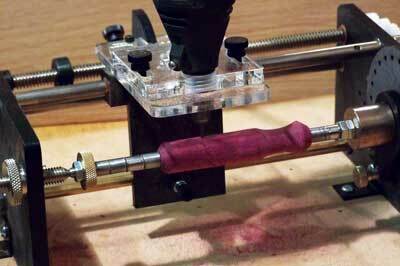 For the purposes of this test I used the standard ball ended burr supplied with my Dremel, but have since purchased a set of the Whiteside carbide cutters designed specifically for the Pen Wizard. These produce a cleaner cut and greatly enhance the end results. The pen blanks to be worked upon are held in place on a standard A or B mandrel of the threaded type. An A mandrel is supplied with the machine as standard but extra mandrels in both sizes would prove to be useful. On initially taking the Pen Wizard from its packaging it appears dauntingly complex, but the instructions are well written and comprehensive. A quick read through them enabled me to turn a simple spiral within minutes. I would, however, recommend the DVD that is also provided with the machine as essential viewing before attempting anything more adventurous. In the DVD, Jerry Beall, the designer of the Pen Wizard, gives a comprehensive demonstration of the use of the machine and also provides helpful recommendations for preparing and finishing the blanks. The cutting tool plate on which the Dremel tool is mounted is driven back and forth along the length of the workpiece by manually turning the lead screw, which also drives the gearbox. The lead screw is fitted with two adjustable stop collars that are tightened with an Allen key to limit the travel. The depth of cut is set by turning the adjusting screw beneath the plate. As supplied, the machine works with parallel-sided workpieces, but by making a suitable pattern and fitting this to the bar against which the adjustment screw runs, shaped workpieces can be used. To achieve good results the pattern must be turned to exactly match the workpiece. The design to be cut is determined by three factors: the setting of the gearbox; the setting of the index plate; and whether or not the guilloche attachment is employed. The gearbox setting is changed by fitting any of the three different sized sets of gearwheels that are provided to the primary, secondary and final shafts of the gearbox in any combination to give spirals or waves in seven different pitches. There is also a reversing mechanism, which means that spirals can be either clockwise or anti-clockwise. The reversing mechanism also enables cross-hatching and checkering. The index plate determines the number of passes and therefore the number and spacing of the cuts. The plate has 24 holes enabling any number of passes that will divide into 24. Using the machine without the guilloche attachment will result in spiral patterns, whilst with the attachment wave patterns are produced. 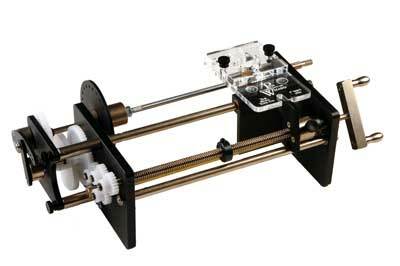 The amplitude of the wave can be changed by adjusting the setting of the crank assembly on the guilloche. The combination of these settings enables a very wide range of patterns to be created. Polygonal barrels can be produced by disconnecting the gearbox to allow the cutting of up to 24 flats. 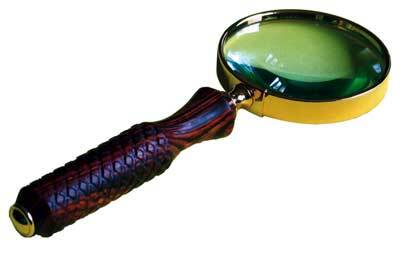 Although designed for pens, the machine can be used to add value to any turned item which can be made on a mandrel, such as the gunstock style checking on the handle of the magnifying glass shown. With a little modification, to add cup centres, for example, I can see opportunities for working on other between centres items limited only by the clearance between the centre of the mandrel shaft and the cutter. 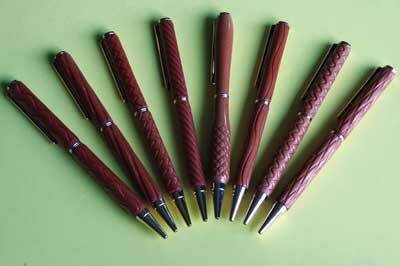 Although expensive, the Pen Wizard is ingenious design and well made. Despite its apparent complexity, it is easy to setup and use and for the serious pen turner it will add interest and value to a multitude of pens, pencils and turned items. I was so convinced that it would pay for itself that I bought the review machine.